Welcome to this week’s Happiness is Homemade Party. Warm weather is here and summer is just around the corner. Today’s features things that will be helpful to you for enjoying the summer and the outdoors. Show us your best posts and stop by to visit some of the other bloggers too. Graduation is coming for many schools! This post has great suggestions on How to Throw a Graduation Party. Get some ideas for how to celebration this important milestone in your child’s life. Popsicles are always enjoyable in warmer weather. These healthy homemade Fruit and Yogurt Popsicles are a tasty summer treat. These adorable Patriotic Mason Jars are perfect for holding your picnic condiments. Finally if you are ambitious you can build this DIY End Table with a built in planter or ice bucket! Disclaimer: Adding your link to this link party gives permission to all 10 Hosts, along with any co-hosts, guest hosts, and participants of Happiness Is Homemade, to share your posts and pictures via social media and as features, roundups, etc. with an explicit link back to your original source. 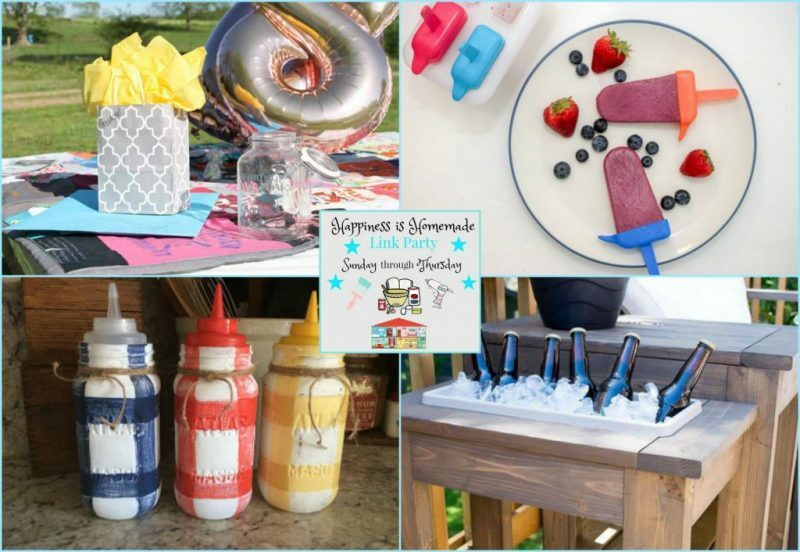 Therefore, linking up you agree to allow us to use your images on each of our blogs in features relating to Happiness is Homemade Link Party. Thanks so much for featuring my outdoor end table this week! The ice bucket will get plenty of use this holiday weekend!